My student cried when I showed her how to voice type in Google. Then, instead of 90 words in one class period, she typed 500. She edited it. She turned it in early. Tears of joy happen when the right tool is taught to the right student. Technology isn’t flashy The right technology makes lives better. Make writing well easier with these four writing tips. Teachers are busy. As I share in Reinventing Writing, teachers need to do what teachers do best — give creative advice. Sadly, many teachers are glorified spelling and grammar checkers. Many students won’t or don’t use the technology tools. Stop the madness! I require students to use Spellcheck and Grammar tools before turning in work. Here’s what I teach. Grammarly is awesome. I have the pro version that includes extensive grammar checking and plagiarism checking. So, I edit every blog post with Grammarly. My students signed up for Grammarly this week. As a result, here are the valuable lessons we learned. Go to Grammarly using the Chrome web browser. Firefox and Internet Explorer take you in an endless loop. They do not seem to give you the option for the free account. You can also search “Free Grammarly” in a search engine to get to the right page. If you go to the page that has you paste in text, sometimes it will take you in the “sign up” loop. Make sure it talks about the free account on the page BEFORE you sign up. Make sure you are clicking on the button that says “Sign for Grammarly, It’s free”. If you start signing up and it doesn’t say it’s free, you’ll have to use another email. I don’t know how to get it to let you sign up for the free version once you start signing up the other way. When it asks, install the Grammarly Chrome add-in. The Grammarly status bar. Notice the percentage it says is copied from other sources! When grading student work, I paste all papers into Grammarly and turn on the plagiarism checker. (See picture above.) Typically, I’ll coach students before they turn their work in so they can see that they should rework it. When you check your own writing, it generates citations for works you quote. It makes generating MLA citations so much easier when I’m writing books. I couldn’t live without Grammarly. The Grammarly Chrome plugin helps me write better email, blog posts, and Facebook status updates. Grammar Coaching Tip. Grammarly doesn’t just correct your work, it teaches you WHY you made a mistake. I find that I’m removing bad habits no English teacher could eradicate. Grammarly is my English teacher. I can focus on content, not commas. Hemingway Tip. Sometimes students who don’t space after the period will have sentences turn red that shouldn’t be. Once they fix their spacing, the red will go away. Formatting Tip. Sometimes these tools will mess up formatting. For this reason, wait to format until after editing. Also, note that Grammarly mistakenly believes the word “Grammarly” is an adverb because it ends in an “ly.” No tool is perfect! You still have to use the software between your ears. As I show in the tutorial movie above, I like to paste into Hemingway. Improve sentences, then go into Grammarly. Teach students to get rid of the colors. Run on sentences jump off the page. Yahoo! Some students want leave a sentence as yellow or red. Have them read the sentence to a friend. See if their friend understands it. If not, simplify. Reading Level Tip.There are times, especially in higher education, when you choose to write at a higher grade level. But I’ll tell you a secret: blog posts with a lower reading level perform better. My goal is below sixth grade. You can still use big words! Just simplify. As seen in the screenshot, Pro Writing Aid has many tools and checks. It is a must-use for those doctoral dissertations or books. I run my most important works through both Pro Writing Aid and Grammarly. It is easy to sign up for the free account on Pro Writing Aid. 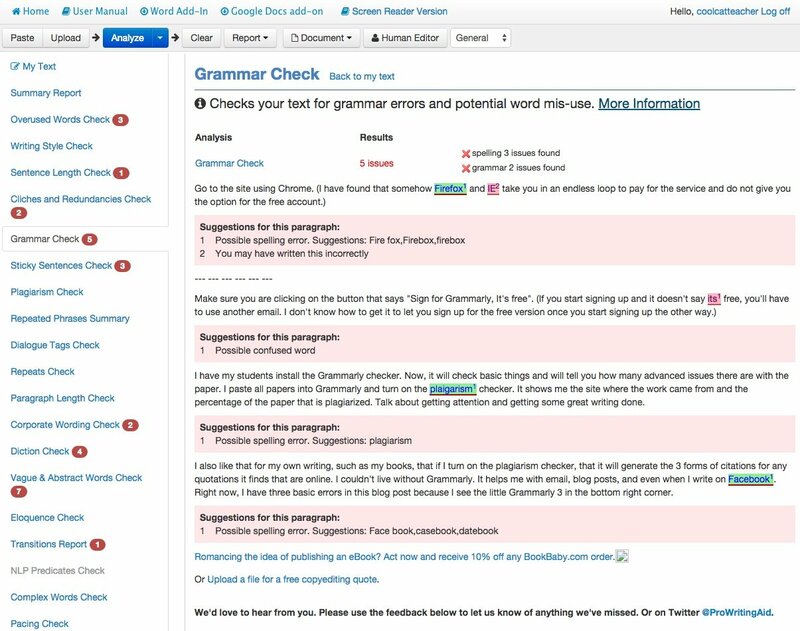 Pro Writing Aid is perhaps the most robust, free grammar checking tool available. It can be complex, so take time to teach your students about each aspect. My favorite tools here are the sticky sentences review and transitions report. 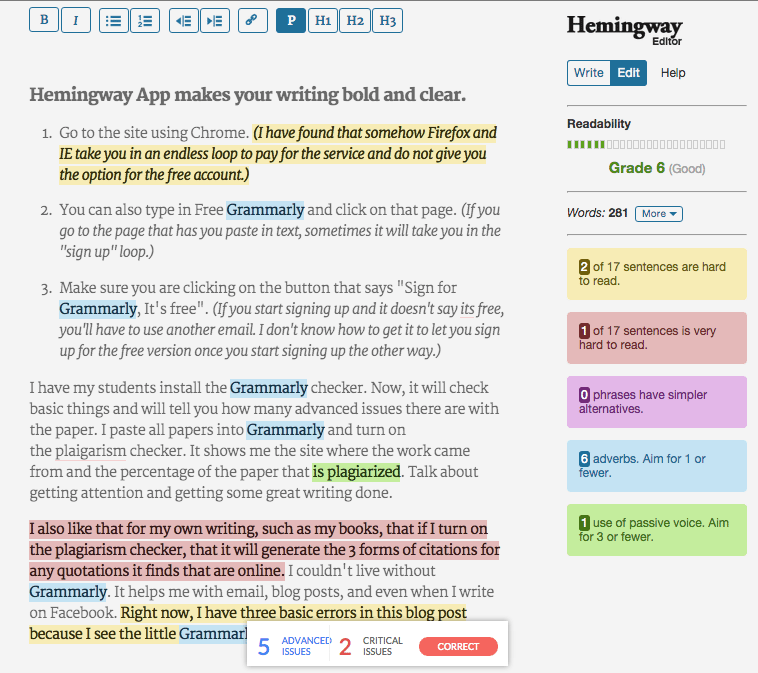 Remove Sticky Sentences for Online Writing. Sticky sentences hurt readability. Sticky sentences have a high number of commonly used words. (You can see these “sticky words” in the purple highlighting below.) Rework these sentences. The more you use Pro Writing Aid, the better you get at avoiding sticky sentences. While sticky sentences may not bother a writing teacher, they are death to a blog post or online writing. Rewrite sticky sentences for improved readability. Add Transitions. I have a list of transition words pinned to my bulletin board. With them in front of me, I can better add them to my writing. The target, according to Pro Writing Aid, is to have transition words on 25% of your sentences. I struggle to get that high, but there is no doubt, that when I add transitions, my writing is easier to read. Pro Writing Aid helps you add transitions to your writing. Try the Pro Version Free. You can tweet about the service and earn some free weeks of the pro version if you want to try it out. The Pro Version makes it easier to edit the document live as you’re working on the document. The Macbook Pro and Mac Air running the newer operating systems have a robust dictation feature. But now, Google Docs has Voice typing (as I demonstrate above.) Just about any computer with a microphone running Google Chrome can use this feature. Not surprisingly, you need to use the Chrome browser. I had to turn on Rapid Release in Google Apps for Education before my students had access. Use a headset mic and teach students to talk quietly. Just a few can do this at once, or you end up with chaos. If your mic cancels out background noise, that helps. You can’t backspace (that I’ve found). Teach students about drafting and just encourage them to get it on the page. Collaborative writing is awesome, as I discuss in Reinventing Writing, but when a student is voice typing, it is best not to have other students in the document. Trust me on this one. Voice Typing and Kids with Learning Differences. For students who struggle with written expression, voice typing is a must use. It will be interesting to see if the testing done on many LD students starts more deeply testing verbal expression versus written expression. The benefit of testing in this way means that we could find students who will benefit from voice typing most of their work. Many of these tools are available offline. If you have poor Internet access or like to write offline, improve your editing. My middle schoolers aren’t ready for all of the tools I’ve shared. I just teach them the spelling and grammar check in Microsoft Word. Then, I take them into Grammarly. Here’s a quick video that I use to get students used to spelling and grammar check. Spelling and Grammar check do you NO GOOD if you don’t USE THEM. Use them. These tools are here. They are available. I require their use. I won’t even grade paper if it has not been checked. I am not a human spell check. I fatigue over time and miss things. I’ll let the computer do that… my student’s computer. Special Needs. Spell check, grammar check, and voice typing are saving technologies for students with special needs. We should expect and teach how to use these valuable tools. They can change the lives of kids! Require students to use them! 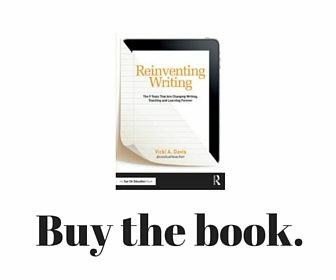 Writing has been reinvented. We must reinvent some of our teaching practices as well. We haven’t even delved into collaborative editing, writing, and collaborative prewriting, but I covered that in my book. Please share your writing tips and tools in the comments. 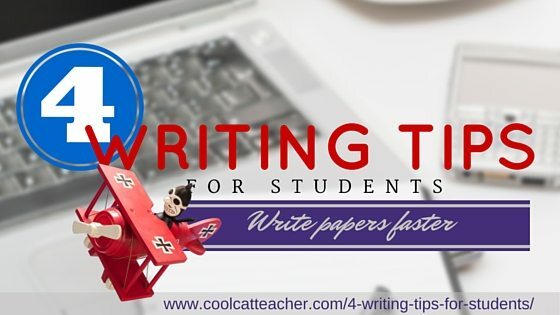 The post 4 Writing Tips to Help the Writing Process appeared first on Cool Cat Teacher Blog by Vicki Davis @coolcatteacher helping educators be excellent every day. Meow!